Product Catalog > Product Catalog > Bags & Storage > #467 - Small Compartment 12" x 10"
These strap-on compartments have soft foam core walls that keep their shape even when empty. 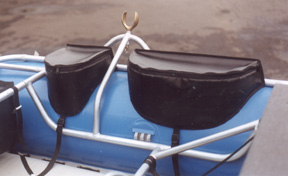 They are completely out of the way for rowing and when strapped tightly to the frame, can be opened with one hand if necessary. The bottoms are mesh for quick drainage. Available in two sizes: Small is 12" x 10".